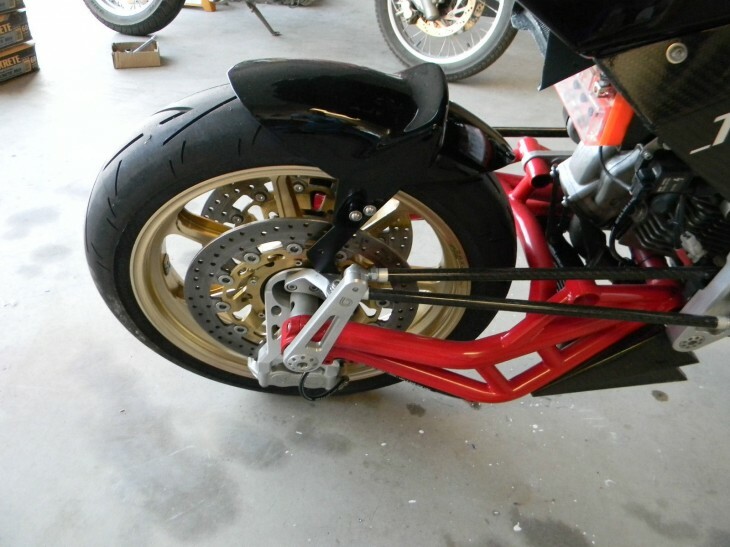 The single-sided front end matches the ELF-designed single-sided swingarm and makes it look like the bike is simply floating above its wheels when viewed from the right, like an artist's sketch made real. Developed by Paioli, it's not actually an alternative swingarm front end like Yamaha's RADD or the Bimota Tesi, but there's no downside to it in terms of function. In fact, that's really the biggest disappointment here: the radical styling that was clearly inspired by the ELF racing machines is just that, styling. There's no futuristic technology or exotic powerplant. 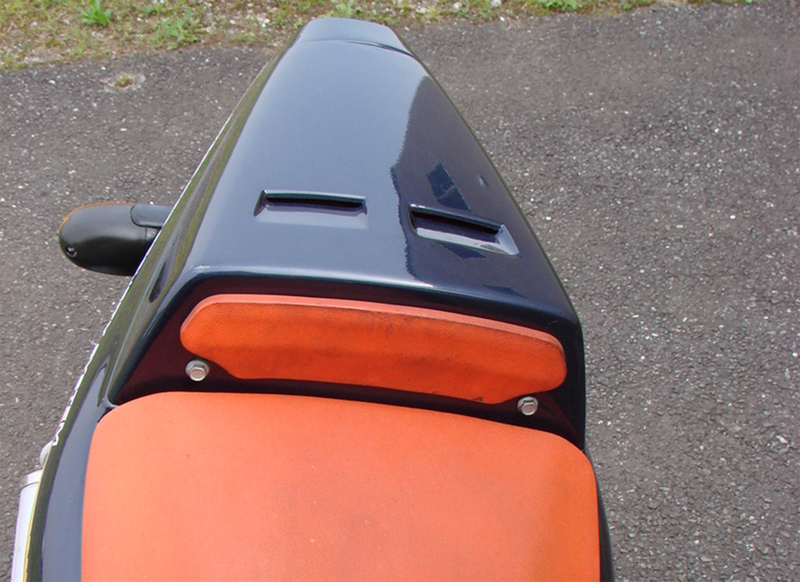 It's just a sporty, economical two-stroke dressed up with stylish bodywork. 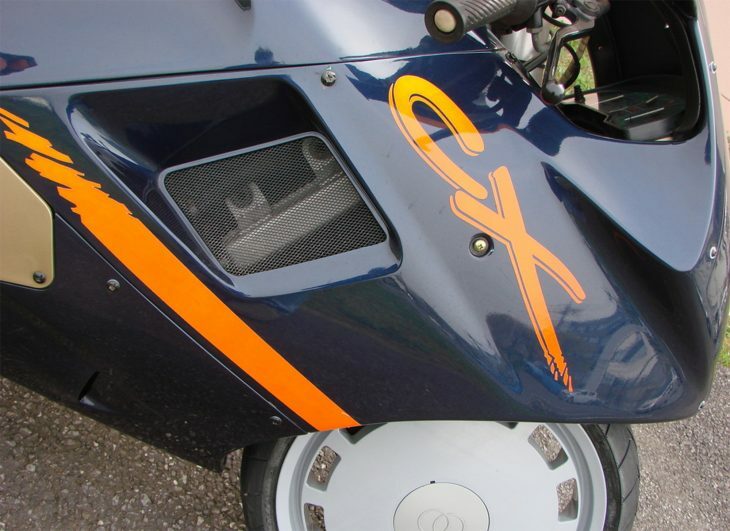 In fact, the most futuristic technology found on the CX125 was the engine counterbalancer that contributed to the bike's exceptionally smooth-running character and the electric starter. 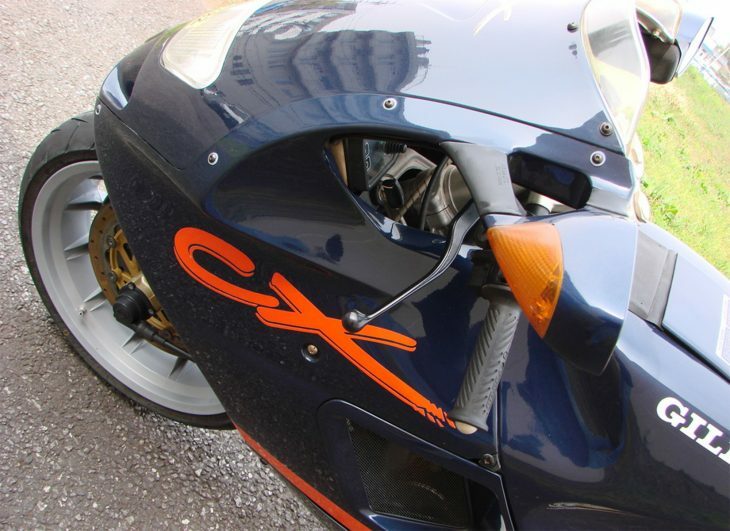 The simple bones underpinning the sleek body mean the CX125 works pretty well, taking into account the minuscule displacement of the tiny two-stroke. The 300lb wet weight meant the 125's 28 rear-wheel horses could push the little machine up to a top speed of around 100mph, but the question really is: at whom was this machine really aimed? 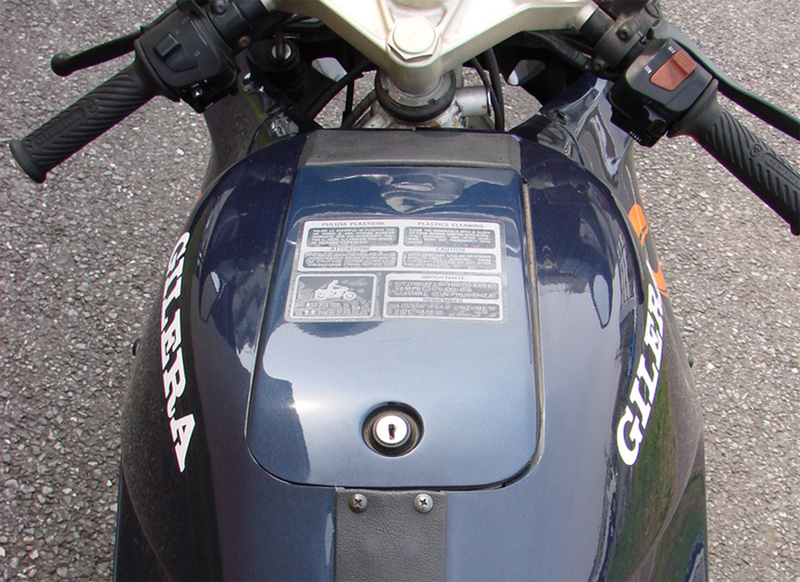 125 two-strokes are, even in Europe, learner bikes or commuters. 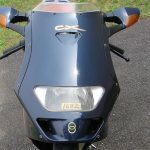 And although the technology of the CX125 was decidedly modern, the futuristic styling wouldn't really have been a priority for practical types, and 16-year-olds looking for sportbikes were probably interested in something much more race-replica-y. 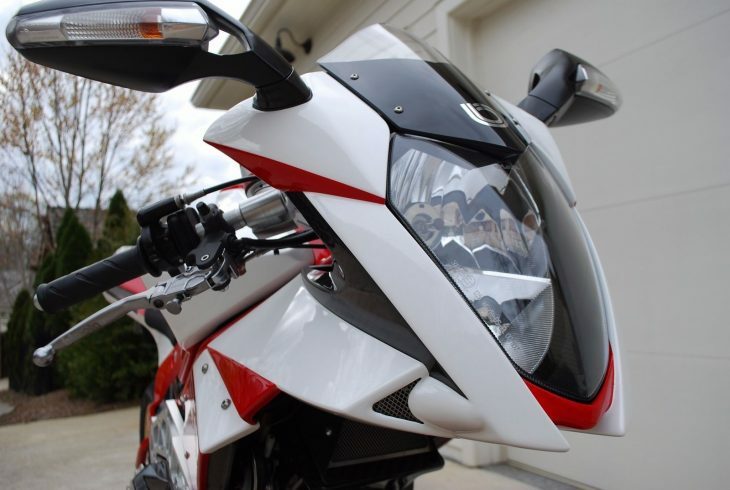 Although it wasn't priced much higher than its much more conventionally-styled stablemate, performance was slightly less and the bike didn't sell very well at the time. 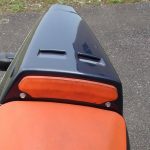 This particular example is complete and appears to be in decent condition, although some cracks in the bodywork are visible and there is some plastic discoloration, as well as a bit of rust and the usual cosmetic issues that arise when a bike sits for any length of time. The biggest issue is the lack of a title. 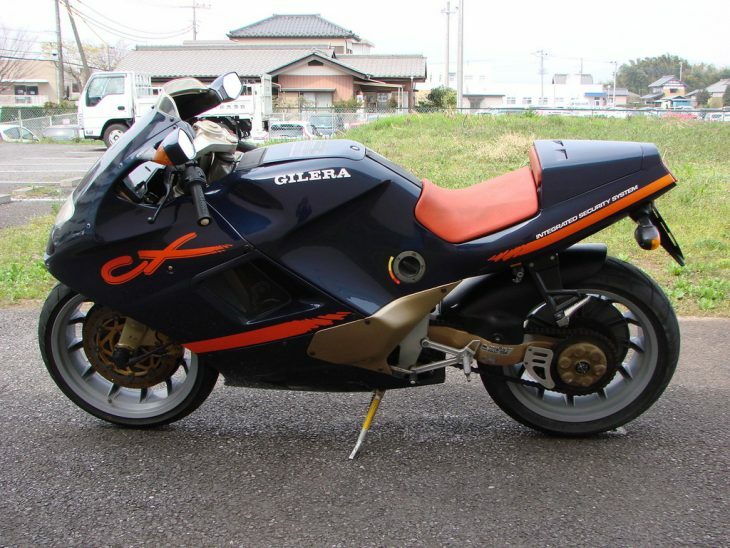 1991 Gilera CX125 located in Santa Ana, California. This bike is in very good condition for it's age. Gauge shows 3684 KM = 2210 miles. There are a few cracks in the plastic body parts, "see pictures". This is a very common problem with these bike. Engine runs great, no problems. 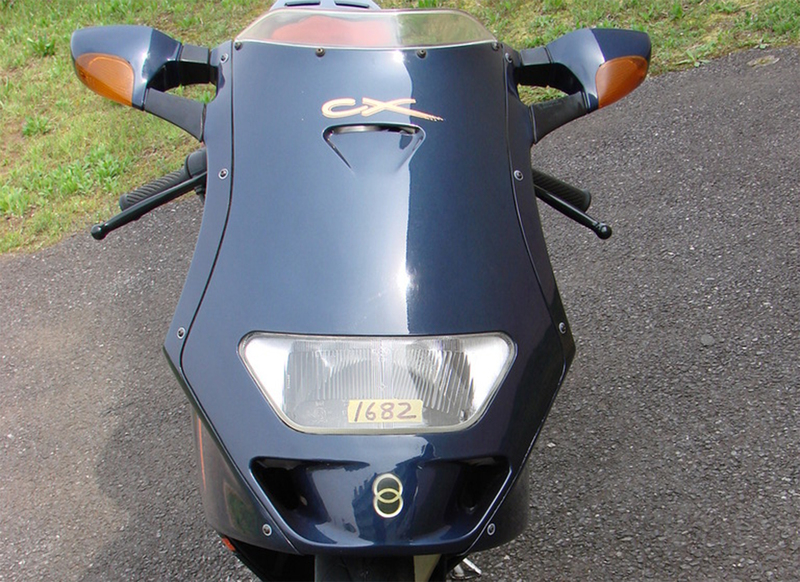 The CX125 is a very rare bike here in the USA. More info is available on our website. Bike is sold with a bill of sale only. I don't have a title for the bike and can't get one here in California. There are no takers yet at the starting bid of $7,995. These aren't exactly cheap for the performance they offer, but a CX125 would make a hilarious weekend ride in Southern California, where originality is at a premium. Honestly, I love these, so it's a shame that it wouldn't be easy to legally register one here. Most Bimotas are about obsessive light weight as a path to improved performance, but their radical Tesi goes a step further. The name literally means "thesis" in Italian, and that's what the series has represented from the start: an experimental alternative to traditional telescopic forks. 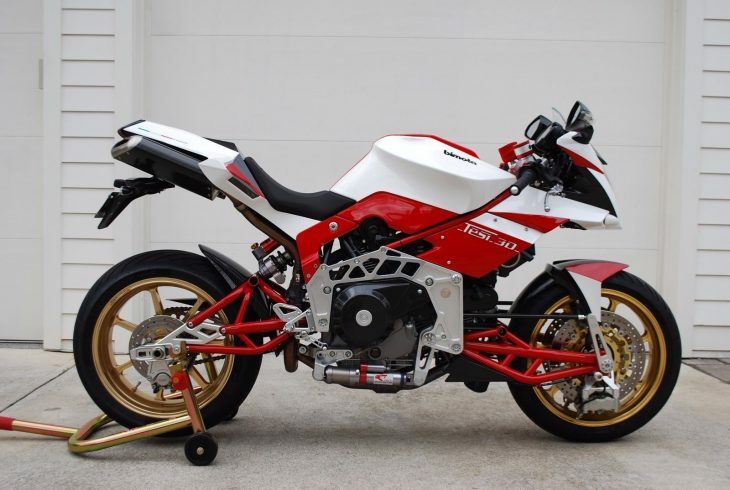 Three-quarters of the Tesi looks pretty familiar: Bimota's hybrid trellis/ machined-aluminum frame and swingarm with minimalistic origami bodywork and a funky Zard exhaust. But the front looks a bit like the rear, with a second swingarm and a hub-center steering setup holding the front wheel, resulting in a machine that looks like nothing else on the road. The Tesi has been around for a while, in several different iterations. 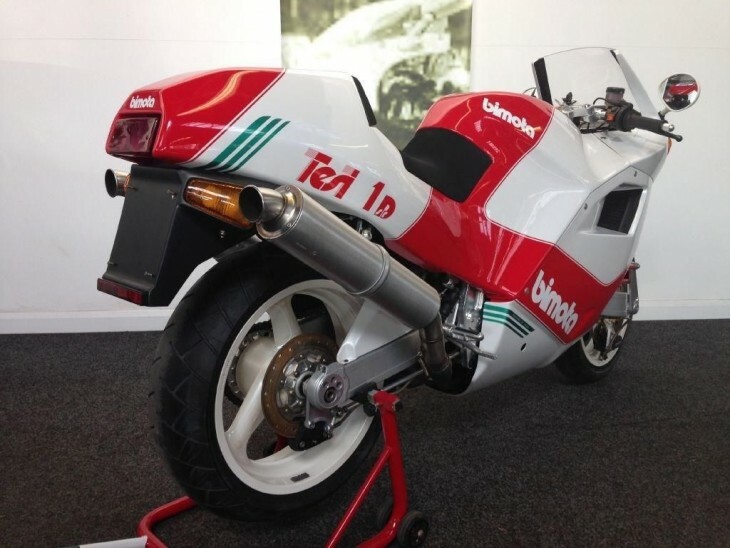 The earlier 1D actually used a liquid-cooled 851 engine, giving it cutting-edge power, but later models used Ducati's air/oil-cooled two-valve engines, making them simpler and lighter, but down on power. 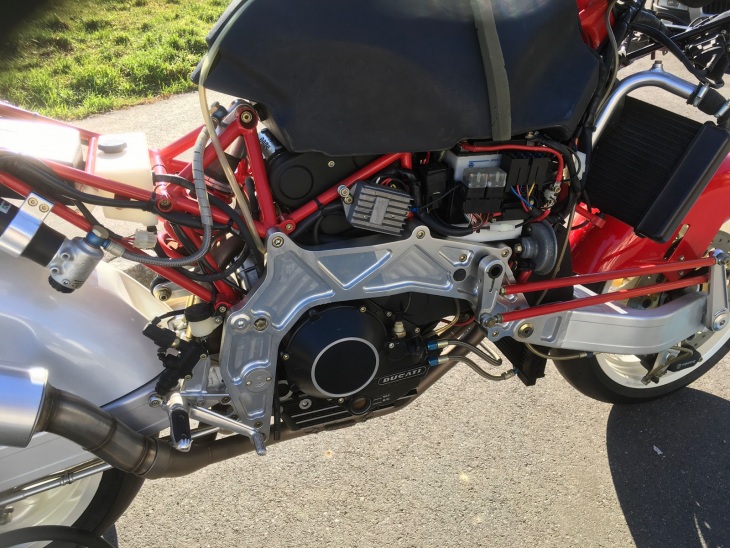 I'd assume this is mainly down to Ducati's willingness to supply Bimota with engines, rather than a particular engine's suitability for the application, although aesthetics may have played a part: the Tesi does look better without a big old radiator cluttering up the place. Regardless, the use of simpler, higher-torque engines mean that the later Tesi models make for excellent road bikes. This is number 05 of 29. 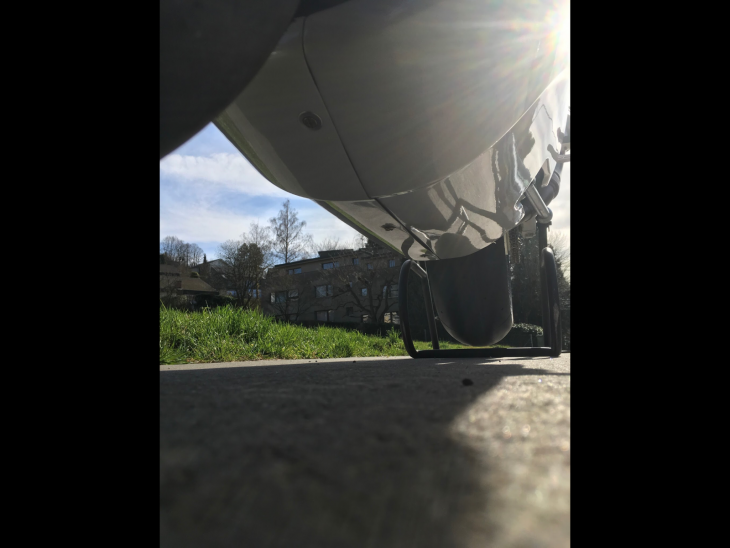 Exceptional condition, new Michelin Power3 tires. Comes with original tools, books, workshop manual, specialty tools, original rear shipping stand, and factory indoor cover. Both keys and Zard Exhaust. 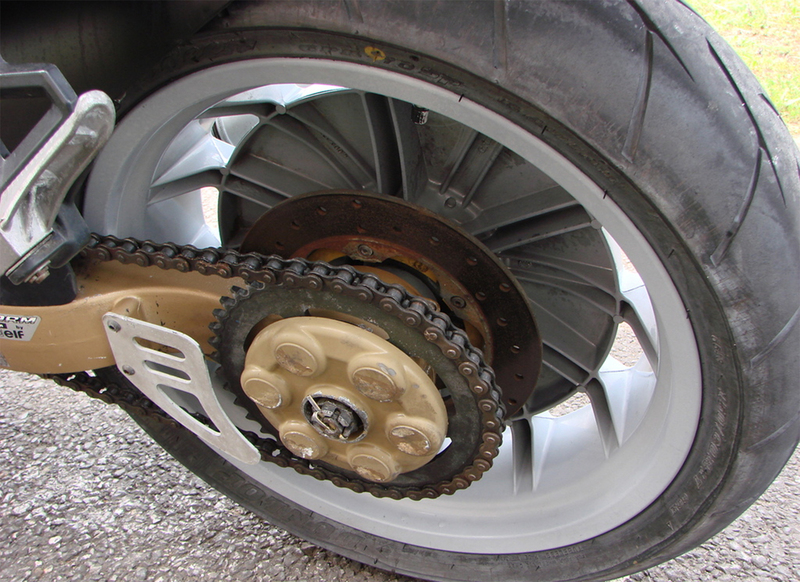 The condition of the bike is as delivered. This bike is a work of engineering art, the details are only appreciated in person. Best guess is only 27 left in the USA, 2 were sold to collectors in Europe. These bikes do not come up for sale very often. The only minor issues circled in the last two pictures. The listing also includes this walk-around video. 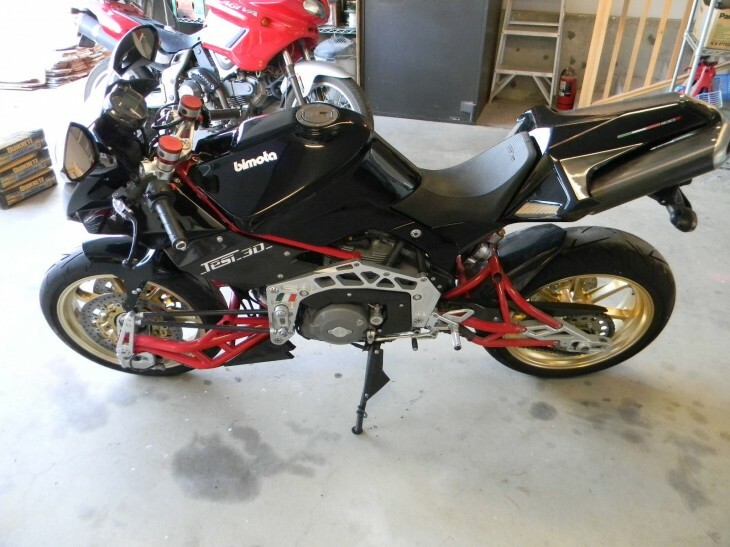 The "minor issues" the seller mentions do look pretty minor, just a couple of cosmetic blemishes you'd be likely to miss the first time you saw this bike in person, since you'd be busy trying to absorb all the jewel-like details of this very exotic machine. Bimotas no longer perform much better than mass-production motorcycles, but they make up for it by being exquisite in terms of craftsmanship and style. And with the Tesi, you get all that and more. Bidding is up to $16,000 with the reserve not met and plenty of time left on the auction. For the money, it's certainly possible to buy a faster motorcycle, but you'd be hard pressed to find one more fascinating and exotic. 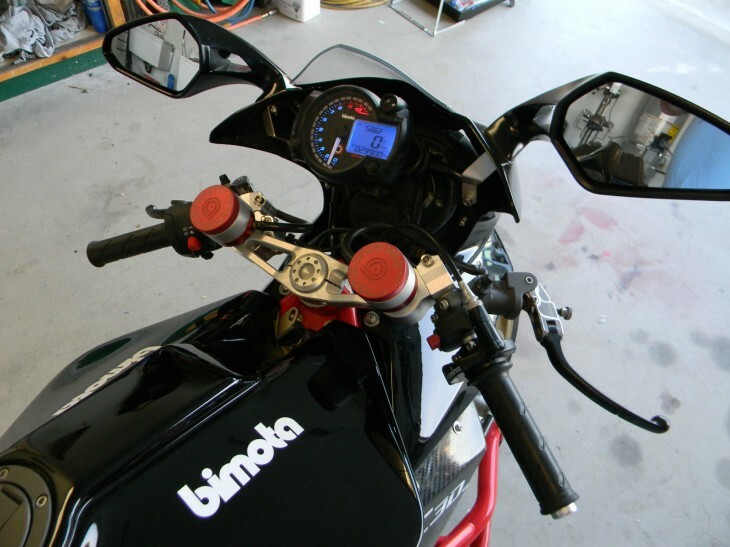 Regular readers of RSBFS have seen many posts regarding Bimota, their history, collapse and rebirth. 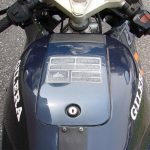 The Bimota V-Due (or VDue) model is usually referred to as the bike that caused Bimota to go bankrupt but this isn't the whole story. The VDue and the sudden disappearance of one of Bimota's main sponsors during the 2000 World Superbike season finally pushed the company into receivership but the Tesi effort actually started Bimota downwards. 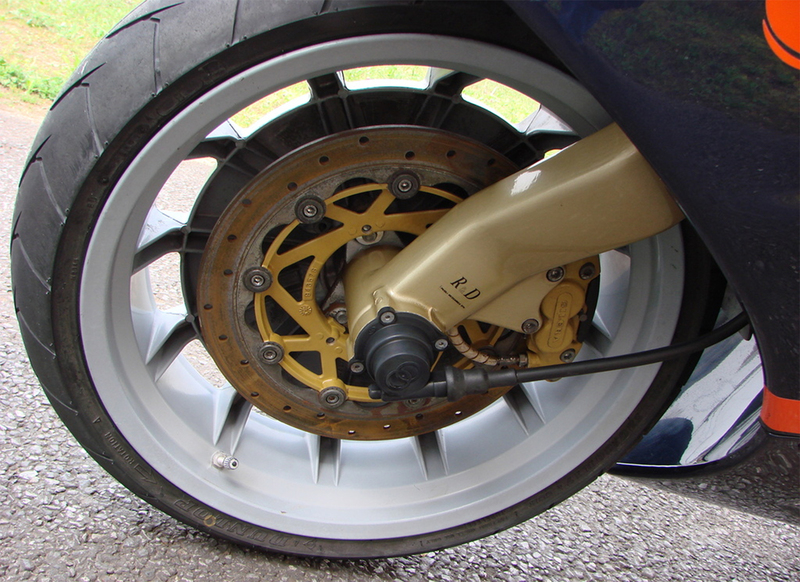 The Tesi series was a design and production effort based on the idea of hub centered steering offering improved stability over conventional forks. 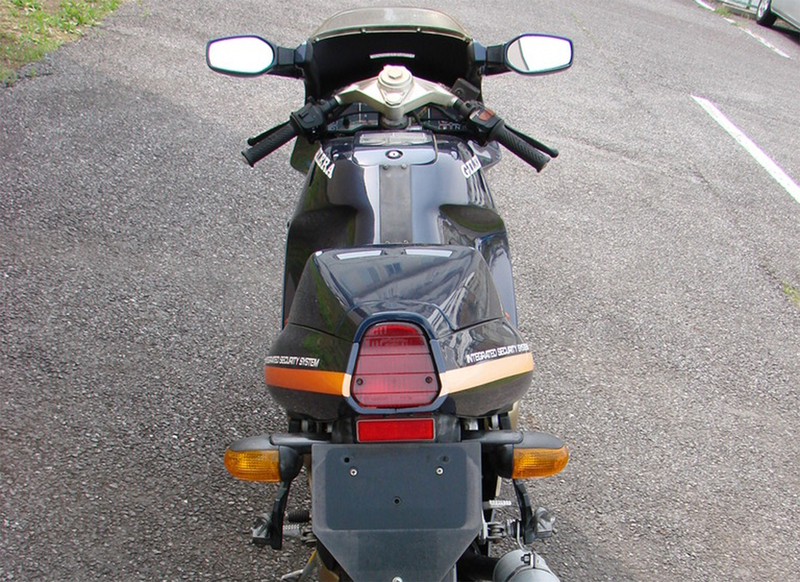 The Tesi 1D appeared in 1991 and attracted attention for its hub-steering system. 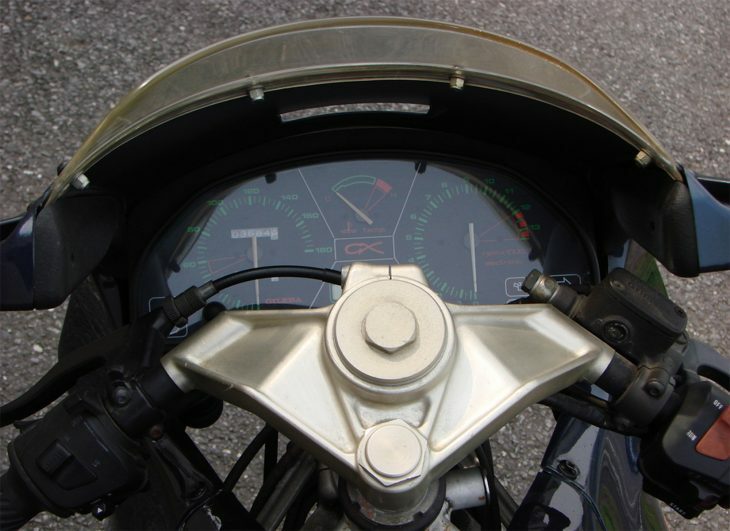 (Note: The ‘D’ in 1D signifies Ducati as power came from the engine designed for the Ducati 851). 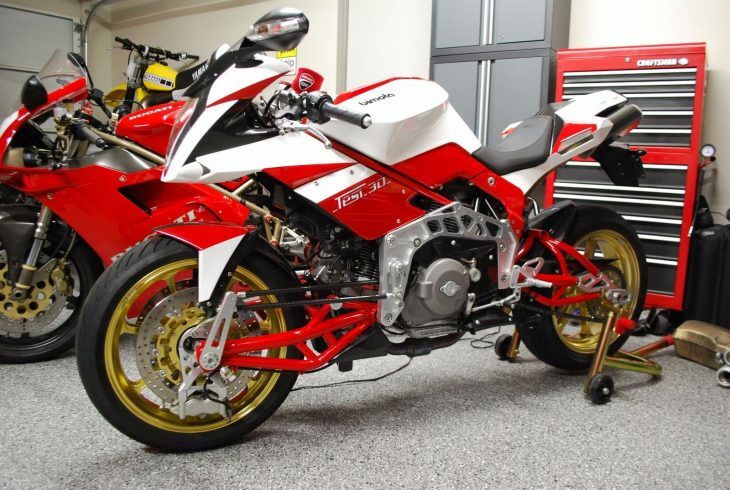 The Bimota was equipped with a fuel injection system Weber dual injector per cylinder and other modifications that produced 113 bhp. 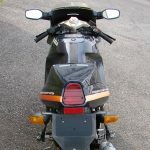 While the Tesi 1D is already a rare bike, the seller indicates this particular Tesi 1D is one of the limited edit SR models. The SR models were different in that the engine had larger displacement, weight was reduced, the tank was reduced to 4 liters and the suspension was switched to Öhlins. Only 164 SR versions of the 1D were produced, and they can be recognized by the green lines on the bodywork. 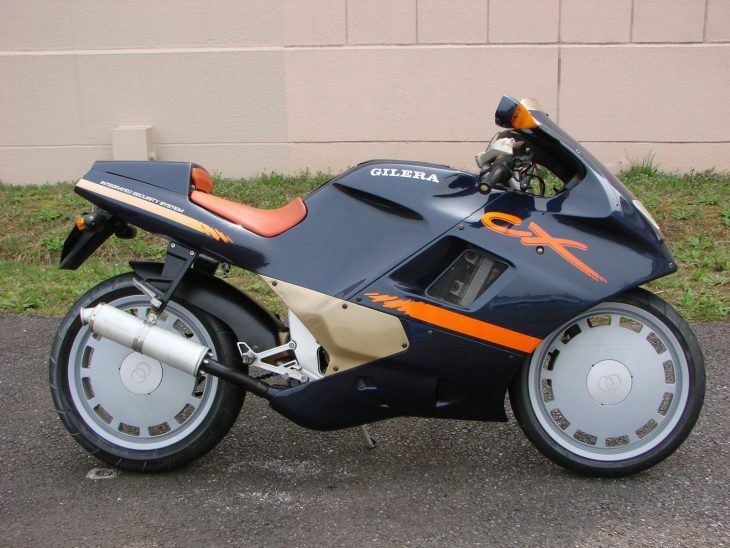 Like a lot of the early 1990's Bimotas', this one appears to have been owned by a collector. The seller states that it was previously in Italy but it is now for sale via a UK-based dealership. It certainly looks to be pristine and even seems to have the stock mufflers/exhaust canisters. Is this ultra-low mileage Tesi 1D worth the $35,000+ asking price? 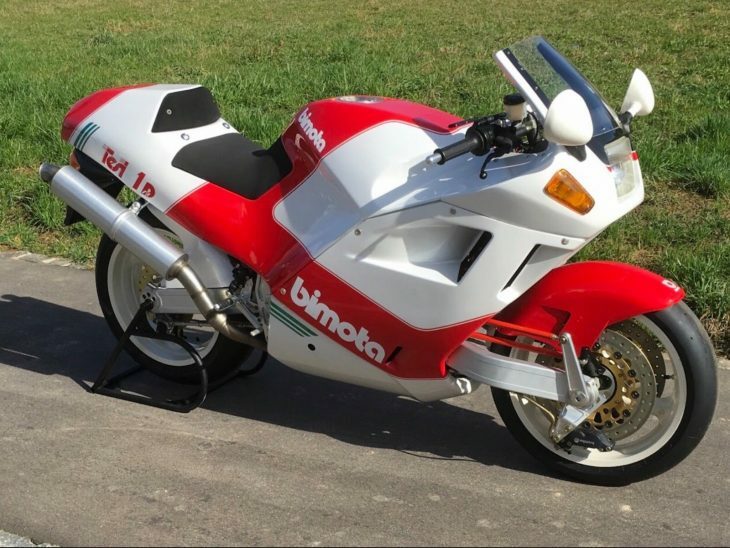 Well prices for the previous ones we have posted here on RSBFS have gone from 15,000 USD back in 2011 to over 20,000 USD just a few years later and all the Bimota Tesi models seem to be moving to the front of collectors most wanted lists. Personally I think this price is a bit high but given the trend, this may be one of those situations a potential buyer looks back on soon and regrets not acting on. Hub center steering bikes make the occasional appearance here on RSBFS. 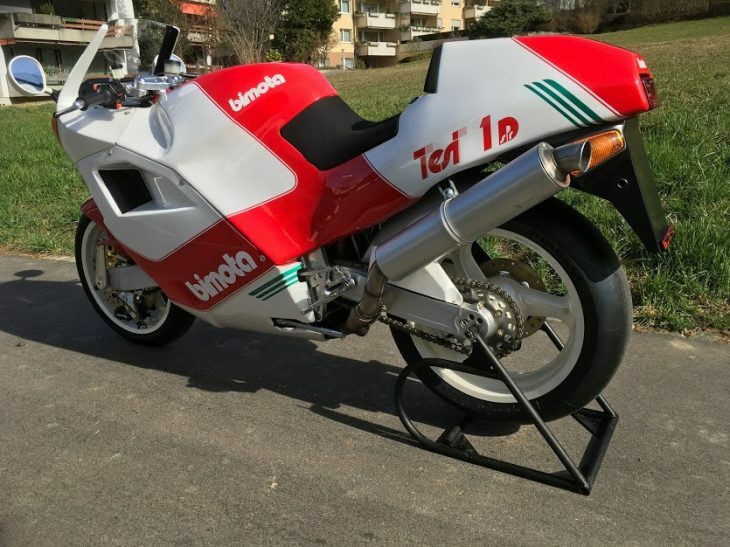 Sometimes they are wild like the Gilera CX125, sometimes they are mild like the Yamaha GTS listed earlier this week...and then we have the Bimota Tesi/Thesis series. 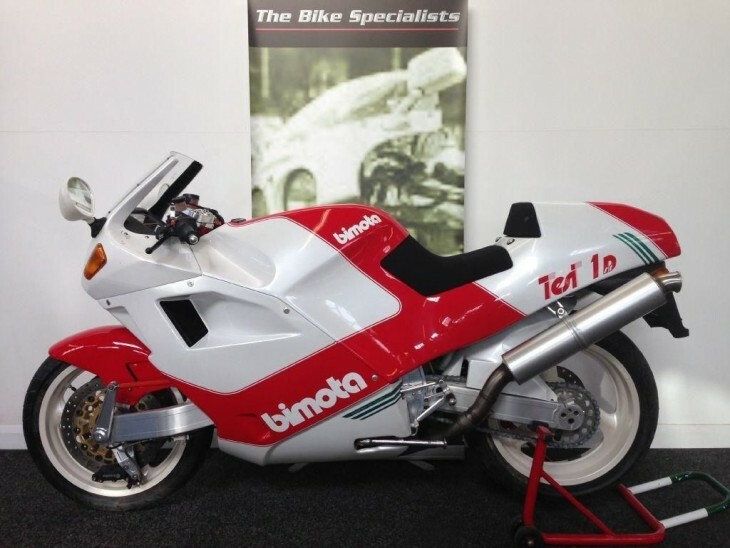 The Bimota Tesi lineup originated with a fairly standard sport bike with an oddball front end with the 1-D, went to the other extreme with the 2-D and then came back to the middle with the 3-D. 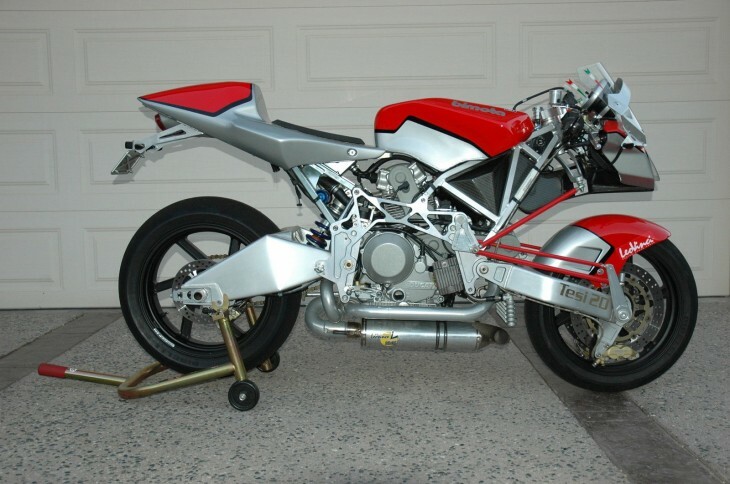 While the 1-d and 3-d make occasional appearances on RSBFS, this is the much rarer middle child, the 2-D.
For those unfamiliar with the middle child Tesi, the 2-D began in 2002 when Ascanio Rodorigo, a former Bimota employee, founded his own motorcycle company ARP and decided to produce an updated version of the hub centered Tesi. Less than 6 months later Rodorigo unveiled his creation, the Vyrus. 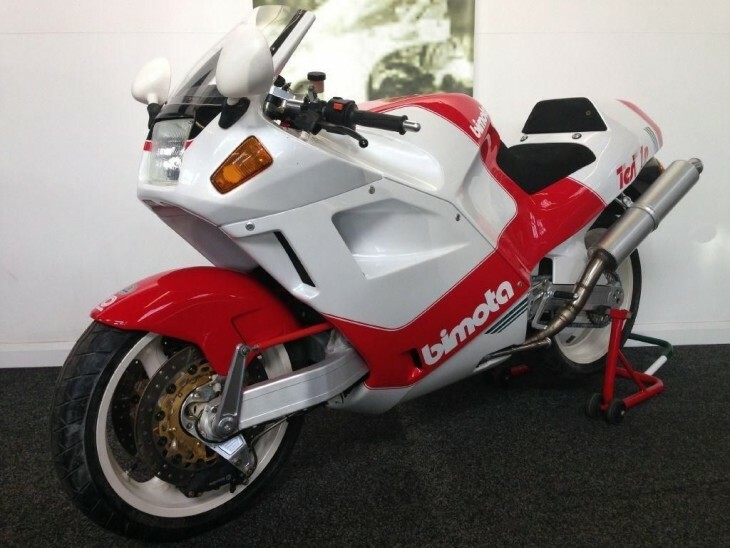 Given his close relationship with Bimota, its not surprising Bimota and Vyrus reached an agreement on how to sell his creation; Vyrus would build the bike and could sell it as a Vyrus, Bimota would be able to re-body/re-badge and sell it as the 2-D Bimota through its more established sales network. To put it simply, the 2-D not only looked miles better than the 1-D, it performed much better too. 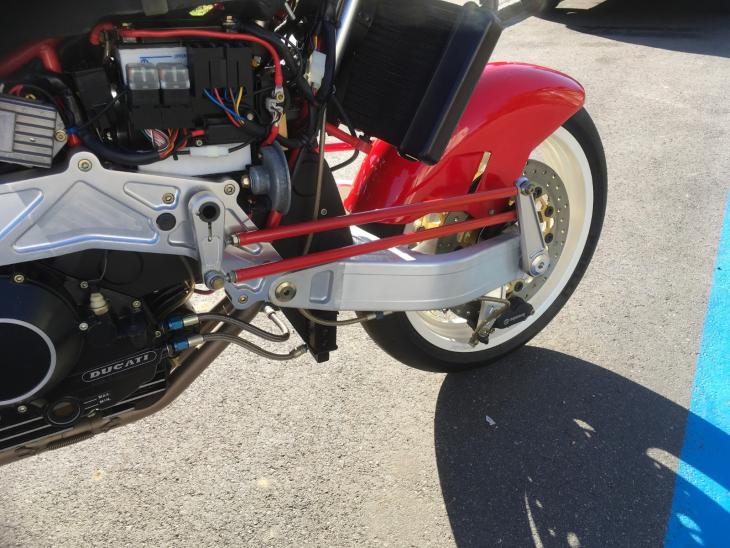 Handling was a quantum leap over the old bike due to the shocks on both front and rear plus the huge reduction in weight and bulk from the 1-D, with the new Tesi having no fairing and almost no bodywork leaving the aluminum omega frame exposed. 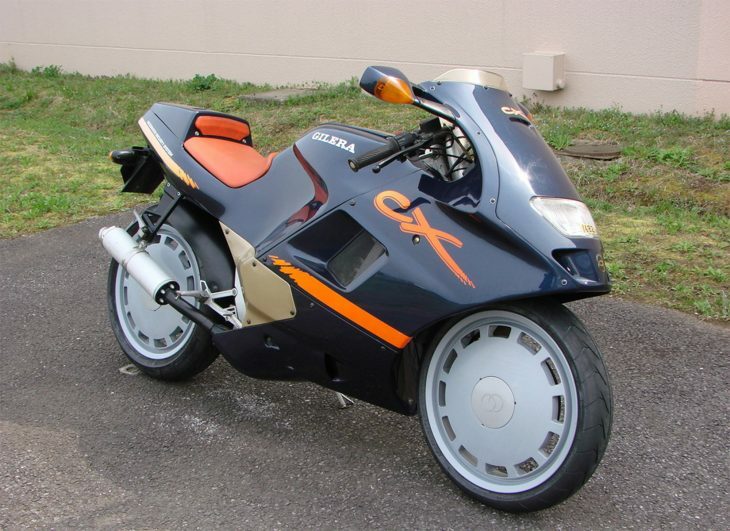 Like most limited edition models (only 30 were made each year), the Vyrus/Tesi 2-D wasn't cheap. 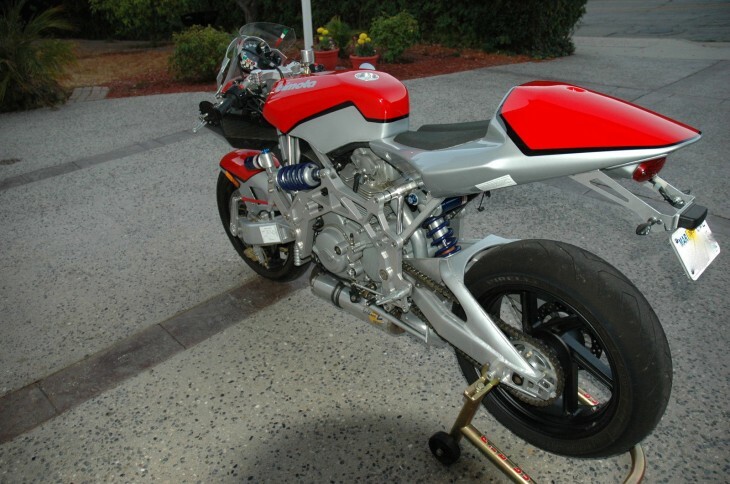 Interestingly the Bimota Tesi 2-D was the more expensive option at €46,000 while the Vyrus was only €38,000. 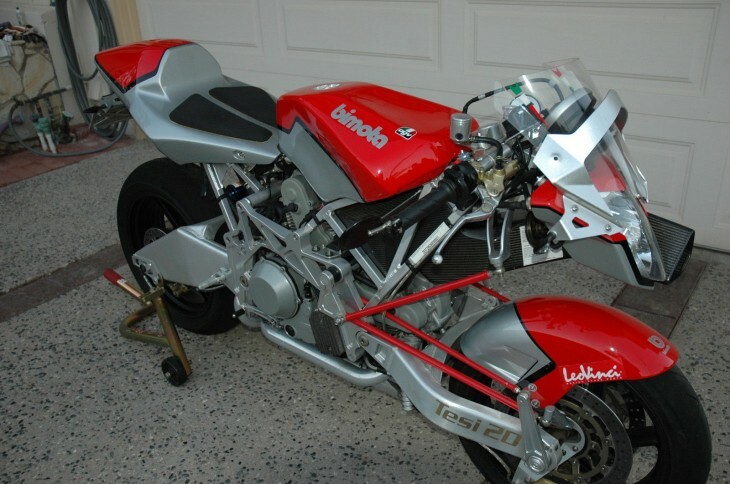 The 2-D was removed from the Bimota lineup in 2007, after less than 50 units were built so as not to compete with the Tesi 3-D under development at the time. One of 10 brought to the US. To my knowledge two have been exported, one is in the Barber Motor sports museum. I know of one more private owner so at the most six are here. One owner, part of a collection & it is just not getting used. Southern Ca. Location , will assist with a trusted shipper. FLAWLESS paint, ceramic coated exhaust & Kellerman signals. Owners manual, & extra key. So what's it worth? 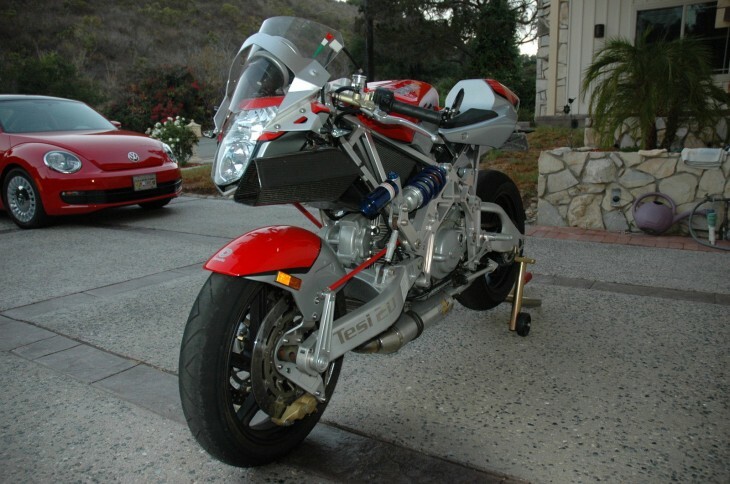 Well, the Tesi bikes are kind of like the Ducati Supermono - prized by collectors, rarely seen on the actual street. Given that this one is one of the rare 2-D series the asking price of 39,000 USD actually seems about right. Personally I would love to have this one tucked away in my collection...maybe a RSBFS reader will pull the trigger and let me come over and drool on it a bit? 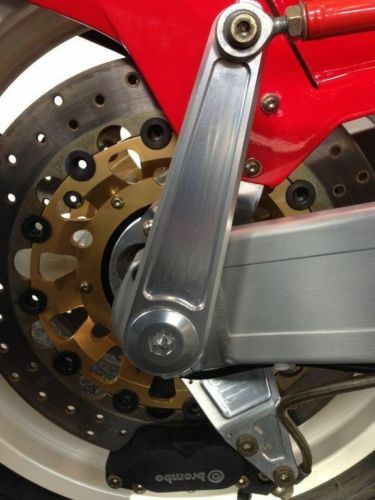 Like the Yamaha GTS posted on RSBFS earlier this month, the Bimota Tesi 3D has a hub centered fork. And that's about where the similarities between the two end. The GTS was a single model attempt by a big Japanese manufacturer to adapt hub centered fork technology to an otherwise standard bike. The result was an uninspiring, heavy, restricted sport touring package that failed to excite most buyers. This particular tesi is listed as being a slightly repaired carbon version here in the USA and is listed with no reserve. KBB lists the value between 20k and 25k so the sellers asking price is actually spot on, even with the damage. That plus the the good eBay feedback number would seem to indicate a reasonably trusted sale. Bidding will still probably be brisk and it would certainly be a worthwhile add for a collector.